Exercise ball: Exercise balls are great ways to get stronger abs. There are countless workouts you can do to really focus on your abdominal muscles, using the exercise ball. Try lying flat on your back and squeezing the ball between your knees (or ankles for a harder workout). Placing your hands on the ground by your side for stability, slowly raise and lower the ball, never letting it fully touch the ground. The slower, the better! You can also do regular old crunches on them, adding extra support and resistance with the ball under the arch of your back, resulting in a safer and more effective ab workout. Good beats: Nothing amps you up for a great ab workout quite like your favorite songs. Research actually proves that good music makes you work harder and your workout more fun. Take a few minutes each week to reshuffle and rearrange your favorite playlist. That way, you’ll never get bored of your fitness tunes. Extra thick yoga mat: Yoga mats open the door to a whole new world of a exercises. Use them to take a yoga class, which increases strength and flexibility, while taking care of some serious toning. You can also perform push-ups, crunches and planks on yoga mats in your living room, adding a bit of extra padding and focus to your workout. I prefer to go for the extra thick ones because working out can already be painful enough and more cushion means less pain while you sweat. Light weights: Weights can add resistance to virtually any exercise, building biceps, toning triceps and amplifying any workout for your abs. 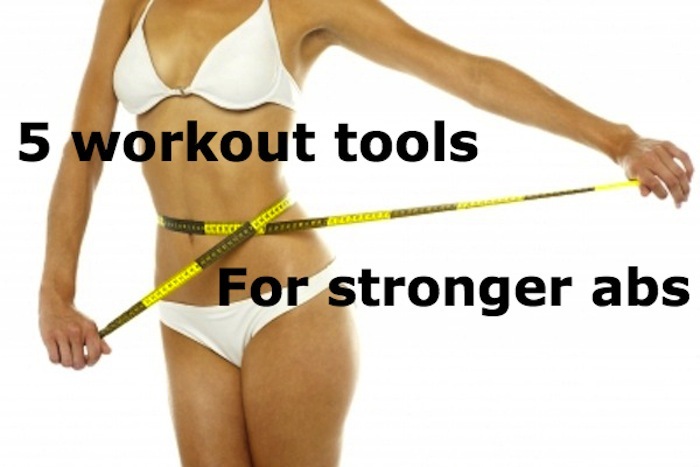 Because of their versatility, they’re one of the best workout tools around. One of my personal favorite ab exercises that uses light weights is the tabletop balance. For this, balance on your new yoga mat, or a cushy surface like carpeting, and place your hands directly under your shoulders. Spread your knees hip-distance apart in the tabletop position. Using light weights, weighing anywhere from two to five pounds, extend your right arm directly in front of you, holding one weight. At the same time, extend your left leg directly behind you. Take a moment to find your balance. Now, pulse, making small, quick movements with both your leg and your arm. Pulse for 30 seconds before repeating on the opposite side, using your left arm and right leg. Go for five reps.
No-spill water bottle: Hydration is one of the most important parts of exercise. Your body needs water to exercise to its full potential. Don’t forget to hydrate, even if you’re having a low-key workout day. No-spill water bottles are the perfect kind for any type of abs exercise, or workout in general, because they allow you to grab a quick drink while you’re still in motion.